If you've Googled "how to wallpaper" and it has sent you here, then the aim of this post is to give you the easiest, least stressful or confusing version of how you can get wallpaper on the wall and have it looking pretty decent. If money is too tight for a decorator, if you've already splashed the cash on a designer wallpaper, or if you just like doing things yourself without having to make multiple cups of tea for a tradesman to vastly overcharge you for his time, then this is my simple guide to what you need and how to overcome potential wallpaper challenges. Wallpaper (obviously) - but enough of it. To make sure you purchase enough roles, measure the width and height of all your walls, then use a wallpaper calculator (which you can find online or download as an app.) Simply Google 'Wallpaper Calculator' to find a host of options from credible sites. Your wallpaper will have all the details about it, including the pattern repeat (the measurement which tells you how far down the roll the pattern will match up again) on the seller's website, on the back of the sample you've ordered (or on the label in the roll if you have one already.) You will need these details to calculate the number of rolls you will need. The wallpaper used in this post is called ‘Sumi’ by Harlequin and you can purchase it here. Wallpaper paste. Don't bother mixing your own - use a ready mixed wallpaper paste that comes in a resealable tub to save you time and avoid waste if you need to wallpaper in stages. Wallpaper application brush. Choose one with a handle in the middle rather than the ones that look like big combs. These are easier to fit into the pre-made paste tubs, and your wrists will thank you for it. A plumb line measuring tool. You can buy these from DIY stores and are a great investment if you intend to do a lot of wallpapering. However, if it is one simple feature wall you are doing, you can get a plumb line measuring app on your smartphone for free. A sharp wallpaper trimming knife or snap blade and a pair of scissors. 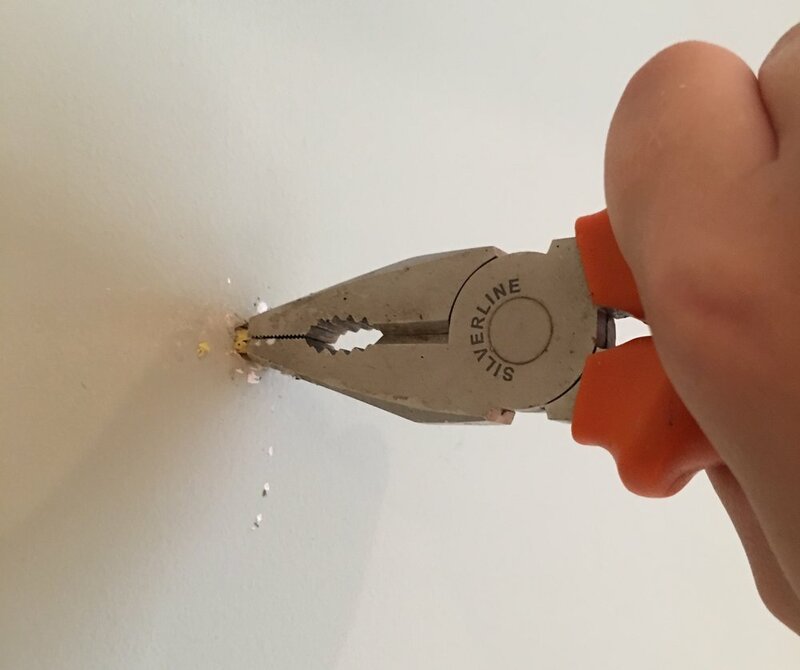 Using the knife is easier, but scissors are better for bits of wallpaper that won't cut because they are soggy from the glue. You'll also need the scissors to cut the paper off the roll. Tape measure and a pencil. A couple of clean cloths for smoothing down the wallpaper onto the wall. Make sure that all your walls are clean and dry and free from dirt and cobwebs. If there are any 'troubled areas' such as damp, make sure that you resolve these problems before putting up the wallpaper. Remove any nails, hooks or screws with pliers. Fill in any large holes with a filler (you can get cheap ready-mixed tubes in at the DIY store) and sandpaper down the holes before you apply the wallpaper so it does not cause a bump under your strip. Choose an 'easy' area of wall (one that has no switches or sockets) to get started. If possible, start in an area that might not be seen so much when finished (if a piece of furniture goes in front of it, for example). This way, if your first one or two wallpaper strips have a few mistakes while you get into your 'wallpapering groove', it's not the end of the world. Measure the length of the wall that needs to be papered, then add about 20cm to the measurement (giving leeway at the top and bottom to account for any wonky walls or unprecise measurements). Unroll your paper on the pasting table, then using a tapemeasure and a pencil, make a mark on the back of the paper where it needs to be cut. Fold your paper over on itself, making sure it lines up at the edges, and cut away your first strip. Using your plumb tool or app, mark a straight vertical line on the wall, close enough to the edge of your first strip, but so it will not be covered by your first roll of paper. Use this marked vertical line as your key guide when applying the paper to make sure you put the first roll on striaght. Do not rely on door frames or the ceiling or skirting, as more often that not these will be at a slight angle! Now you have your first piece cut to size and your plumb line drawn, it's time to apply it to the wall. The wallpaper rule has always been that you paste the wall and you paste the paper, but I don't really understand why. I found that by pasting the paper, it's a nightmare to transfer it from table to wall -it sticks to you, it sticks to itself. Instead, I just give the wall one generous coating of glue (place a roll against the wall first and mark how far along the wall needs to be pasted), then just paste a small piece of the paper in the top corners so that it is easy to first attach. Apply your strip to the top of the wall, then gently smooth it down the wall using gentle strokes with your clean cloth. Smooth out from the middle of the paper to the edges. If it is not going on perfectly, don't worry - breathe - gently peel if off, then apply it again. Remember to use gentle strokes so not to cause creases in the paper. Once you think it is laying nicely, use your cloth to smooth down the edges. Apologies for the manky hands - I'd had a slight accident the week before! Again using your cloth, push your paper in as far as it will go into the crevice where the paper meets the ceiling and the skirting, creating a faint line which will act as a marking to where you will cut away the excess. The second strip is harder than the first as you can't just measure and stick it up, you need to match up the pattern. Depending on the type of wallpaper pattern you have chosen, this may be easy or a bit of a pain. Patterns with a big repeat drop mean you may get a lot of wastage. Take the roll and slowly unroll it against your first strip until you can see where the pattern meets. if there is going to be alot of excess paper at the top, make a mark so that you can cut away what won't be needed. Make sure that your second strip accounts for the length of the wall, the excess at the top of the roll, and then also your extra 10cm leeway at the bottom. When applying this second strip, you are totally focusing on matching up the pattern, plus meeting the edge of the first strip. Don't let your papers overlap as this will cause a glitch in the pattern and your paper to look 'raised' against the wall. Place your papers edge so it meets the other, then gently slide the paper up and down until the pattern meets up. Once this is complete, gently stroke your paper down, pushing away from the matched edge with your cloth. Two strips down - many more to go! The trick with corners is to first focus on the wall in hand, then focus on moving the second part of the paper round to the next wall. Meet up your edge and pattern as before, then gently stroke with your cloth the paper into the corner. Don't put too much pressure on the top and bottom of the corners at first, as you do not want your paper to crease. Once you are happy that your paper is lined up against the previous strip and meets the corner, gently rest the paper on the second wall. Using your scissors, make an incision in the paper at the top where the corners meet the ceiling. This will help you fold the paper round onto the second wall. Make another cut at the bottom of the strip where the paper meets in the corner at the skirting, then focus on smoothing out the paper onto the wall from the corner outwards to the edge. Make sure your paper hasn't pulled away from the previous strip. If so, gently lift if off, re-meet it, then smooth it down again against the wall. The biggest pain when wallpapering are those pesky light switches and sockets. Hang your wallpaper strip as before, but don't smooth down the strip too much. Feel where your socket or switch rests under the paper, then in the most central point make a small hole with your scissors. Gently cut away the paper, moving from the centre of the socket towards the edges, until you can press it against the wall and the socket or switch is fully exposed. Using your cloth, gently smooth the paper down around the edges of the socket/switch, then make the final cuts with your trimming knife. Smooth the rest of the strip down in the direction towards the switch/socket. The most annoying and common mistake I make is cutting away too much paper accidentally when cutting away the excess. Don't worry - simply go back to the strip you cut away, stick it back on, then re-cut. Try and meet the cut line as much as possible and avoid overlapping. Put some paste on your finger and rub it over the join. This will be much less noticeable once the paste has dried - honest! Air bubbles are avoided by really smoothing down your paper with your cloth. If your paper is getting a lot of bubbles, gently peel it back off the wall without removing it completely, then smooth out the bubbles towards the edge of the paper. You may think your paper looks bubbly even though you have smoothed it down the best you can. Chances are it will dry fine as the paste/paper is designed to stretch once dry. Flappy, peeling edges are a sign that there was not enough paste put on the edges of the paper. Put some paste on your finger tip, gently lift the edge, then run your fingertip up and down the edge of the paper. Smooth the paper down again with your cloth. And there you are! It really is just a case of cut, glue, stick, repeat! Love DIY? Get my posts sent straight to your inbox!